Yesterday, in Saint Peter’s Square, Pope Francis consecrated the world through the intercession of the Immaculate Heart of Mary in front of the original statute of Our Lady of Fatima. If you haven’t figured it out already, Pope Francis is quite the Marian Pope! Like his predecessors, he has a deep love and devotion to the Blessed Virgin Mary. Remember Day 2 of his Pontificate? Where did he go? 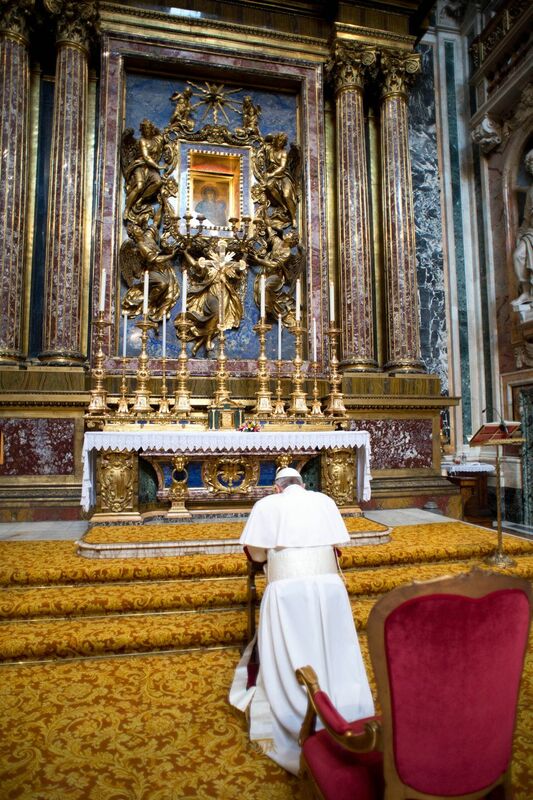 He went to the Basilica of Saint Mary Major in Rome and offered flowers at the altar of the Salus Populi Romani. 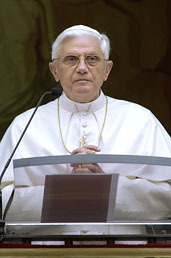 Rocco Palmo, author of Whispers in the Loggia, says it perfectly about Pope Francis, “whenever the Theotokos comes around, the 266th Bishop of Rome simply loses himself and is spiritually transported to another place.” Pope Francis truly loves the Blessed Mother and has consecrated his papacy under the care of Our Lady of Fatima. Along with the last two papacies, we are blessed to be alive during this time in Church History! Before continuing on, I suggest to you two articles. 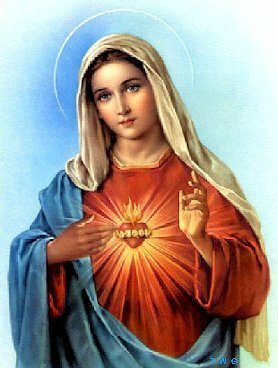 First, read – Pope Entrusts World to Immaculate Heart of Mary (Catholic News Agency). Second, read The Great “Untier” – For Francis, There’s Something About Mary (Whispers in the Loggia). Although the Feast Day of Our Lady of Fatima is officially May 13, I wanted to share some excerpts of great insight from Blessed John Paul II and Pope Emeritus Benedict XVI. These two Popes can say great things in a few paragraphs, where it takes the average person pages upon pages to say something not even half as good. The emphasis below is mine. “If the Church has accepted the message of Fatima, it is above all because that message contains a truth and a call whose basic content is the truth and the call of the Gospel itself. “Repent, and believe in the gospel” (Mk 1:15): these are the first words that the Messiah addressed to humanity. The message of Fatima is, in its basic nucleus, a call to conversion and repentance, as in the Gospel. This call was uttered at the beginning of the twentieth century, and it was thus addressed particularly to this present century. The Lady of the message seems to have read with special insight the “signs of the times”, the signs of our time…the children of Fatima became partners in dialogue with the Lady of the message and collaborators with her. “A sure way of remaining united to Christ, as branches to the vine, is to have recourse to the intercession of Mary, whom we venerated yesterday, 13 May, in a particular way, recalling the apparitions at Fatima, where she appeared on several occasions to three shepherd children, Francisco, Jacinta and Lucia, in 1917. The message that she entrusted to them, in continuity with that of Lourdes, was a strong appeal to prayer and conversion; a truly prophetic message, considering that the 20th century was scourged by unheard-of destruction caused by war and totalitarian regimes, as well as widespread persecution of the Church. 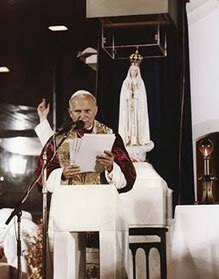 Moreover, on 13 May 1981, 25 years ago, the Servant of God John Paul II felt that he was saved miraculously from death by the intervention of “a maternal hand” – as he himself said – and his entire Pontificate was marked by what the Virgin had foretold at Fatima. Although there is no lack of anxiety and suffering, and although there are still reasons for apprehension about the future of humanity, what the “Lady in White” promised the shepherd children is consoling: “At the end, my Immaculate Heart will triumph”. So what does Fatima teach us? The underlining message from Fatima is hearing and living the call of the Gospel, a conversion and repentance must occur, we need enter into dialogue with the Blessed Mother who leads us to Jesus Christ, we must separate ourselves from sin, and entrust ourselves to the Immaculate Heart of Mary. Through the intercession of the Immaculate Heart of Mary, Our Lady of Fatima, and Blessed John Paul II, may we turn away from sin, repent and bring our lives in union with Jesus Christ. Amen. Just joined as first degree member and feel especially welcomed to serve. I look forward to earning further degrees. Please pray for my success in helping our blessed organisation. I do this in honor of my beloved Dad and Father in Law. What a perfect opportunity for Jesus to “Lift Mary up” to her proper place as it were…the place that catholicism gives her. It seems that the reasons there are no passages of scripture placing Mary as lifted up is b/c it is not true. There are scriptural passages in Matthew, Luke, and John that speak about Mary. She is the greatest human creature and does not have “divine power.” Catholicism does not say anywhere that she has divine power – I am not sure how many times we have to repeat this. Everything she does for the Church is given to her by Christ himself. Furthermore, worship and adoration is meant for God and God alone. We highly venerate Mary because she is the Mother of God – no Mary, no Jesus. He raises her up at the Wedding at Cana (John 2:1-12) when he works his first miracle at her request and in John 19:25-27 when gives her to all of humanity through the beloved disciple while he hangs on the Cross. In regards to your comment about Luke 11:27-28, you completely misunderstood what these words really mean. We have always believed, most especially the Tradition of the Church has taught us, that these words are great praise for Mary. During the time of Jesus’ preaching, Mary received these words by then extolling a kingdom beyond the concerns and connections of flesh and blood. Our Lord declared that anyone who heard these words and kept the word of God was blessed, as Mary had done and was doing. Furthermore, it is better to belong to Jesus’ spiritual family than to his earthly family. Mary, his mother, is blessed on both occasions since she is the biological mother to the Church and the perfect example of those who hear and keep God’s words. “We have always believed, most especially the Tradition of the Church has taught us, that these words are great praise for Mary”. This is exactly what the problem is Tom, and you clearly explained it. You should be listening to what Gods Word tells you for it is profitable for “teaching, correction, reproof and training so that you may be adequate & equipped (2 Tim. 3:16-17). “Traditions of men” and “The Church” are NOT Scripture. Scripture is Gods Word and Gods Authority NOT men who are sinners. Again the Bible is replete with thousands of passages regarding the Father, Son, and Holy Spirit and the roles the play in our lives before, during and after Christ’s death, burial, and resurrection; there are none regarding all of the “Doctrines of Mary” which the catholic church teaches….why? Clearly it is because they are taught by “the church” NOT Scripture. By the way, I do not “hate the church” as you stated. My heart is only broken for those who are so lost. You said in your reply to “do some research”. For 3 years I researched catholicism Tom, and I believe it’s you that needs to do some research. I’ve read Ludwig Ott’s and Keating’s books. Ott was catholicism’s leading apologist until his death when Karl Keating replaced him. 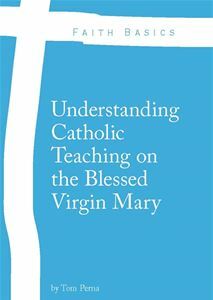 In both of their books they teach the “Doctrines of Mary” as truth. Who’s truth? What truth? It’s not Biblical or Gods truth b/c NONE of it can be found in Scripture…WHY? Doctrine of Mediatrix: (no grace is conferred on anyone without her actual intercessory cooperation) – This seems rather like divine power to me. Any religion that has a source of divine revelation other than the Bible, is a false religion, and that’s why my heart breaks for you who are being taught that which is false and pagan. You stated: “We have been around for 2000 years and not going anywhere”. Sinful men have been around longer than that Tom, and are still here today. Men are corrupt, but Gods Word is PERFECT, PURE, and UNCORRUPTABLE….listen to Scripture instead. Remember Tom, the men you are listening to, are the very men that Christ died for. They are sinful men and are the reason Jesus died in the first place. First, you can read whatever you like, but if you are not open to hearing the truth, you will never hear it. If your heart is not open, you will never be ready to accept the truths of the Catholic Church, the Church that Christ himself founded upon St. Peter (Mt. 16:13-20). You are not open to it, but read – Born Fundamentalist, Born Again Catholic as well as Evangelical is Not Enough. Those two authors were once fundamentalists and argue the same points you bring up with me. Maybe they will help you, but again, if you are not open to hearing what they have to say, it doesn’t matter how much you read. Second, please provide me the scripture verse where it says that the Scriptures alone are the sole authority. 2 Timothy 3:16-17 does not work either. It’s not stating that. I want to see where the Scriptures say that the Scriptures are the sole authority. 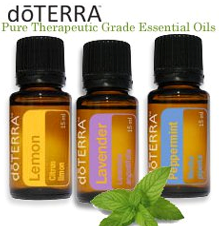 Furthermore, I would imagine you believe in the Holy Trinity? Where is the word “Trinity” in the Sacred Scriptures? Third, in regards to Tradition, it is the Traditions of the Church that kept the Church alive for the first 400 years before the Canon of the Holy Bible was compiled and composed, which by the way was developed by the Catholic Church in ecumenical councils. Furthermore, Tradition wasn’t something that just developed in the New Testament, but was alive in the Old Testament as well. There is a harmony that exists between Sacred Scripture and Sacred Tradition. When you take away one of them, as you do with Tradition, you are destroying that harmony. It would be like dividing the drum and bugle corps. Removing the bugles from the band would allow you to hear music, but it would be incomplete unless the bugles were providing the harmony for the drums. The two together are complete and sound. Fourth, in regards to your link, sorry, Dan, I don’t have time to listen to the link you provided. I should be at work, but I wanted to answer your response to me. Furthermore, I have heard all those same arguments in the past. They are the same arguments every Protestant has made in the past. Do you really think you are brining me something new? If you (not just you…this is plural) actually read the Scriptures in its entirety you would see in the Old Testament that everything the Catholic Church teaches and professes is foreshadowed (typology) and fulfilled in the New Testament – The Mass, the Eucharist, Reconciliation, Mary, the Papacy, and many subjects. The authority that Christ gave to St. Peter and Apostles extends throughout the Church. It’s called Apostolic Succession. The Church grew organically from a small seed provided by Jesus himself to what we have today (see The Spirit of Catholicism by Karl Adam). Lastly, I know with all my heart and soul that the Catholic faith is the true and most complete faith. It contains the fullness of truth. If you are seeking me out to persuade me to listen to your anti-Catholic rhetoric, I am sorry but you are wasting your time. I was educated by professors who once thought like you do but are now Catholic. I appreciate your response and I am open to having a conversation with you, but know this, I would never leave the Catholic Church. Tom, I believe that you refuse hear anything outside of what you’re being taught is the fear that things will make sense Spiritually, and that’s why you don’t want to check out the link I sent you. I listen to and read catholic dogma links to affirm that what I believe IS the truth so I don’t find out that it isn’t true while standing before the Lord. The primary catholic argument against sola scriptura is that the Bible does not explicitly teach sola scriptura. Catholics argue that the Bible nowhere states that it is the only authoritative guide for faith and practice. Well Tom, this is true, BUT, you fail to recognize a crucially issue. We both know that the Bible is the Word of God. The Bible declares itself to be God-breathed, inerrant, and authoritative. We also know that God does not change His mind or contradict Himself so while the Bible itself may not explicitly argue for sola scriptura, it also definitely DOES NOT teach that popes, traditions, or history, are authoritative either, so the catholic argument against sola scriptura is mute. Sola scriptura is not as much of an argument against tradition as it is an argument against unbiblical, extra-biblical, and/or anti-biblical doctrines. The only way to know for sure what God expects of us, is to stay true to what we DO KNOW He has revealed in the Bible. We can know, clearly, that Scripture is true, authoritative, and reliable. The same cannot be said of popes, tradition, or men. The Word of God is the only authority for the Christian faith. Traditions are valid only when they are based on and are in full agreement with Scripture. Traditions that contradict the Bible are not of God and are not proper for the Christian faith. Sola scriptura is the only way to avoid being bias and to keep personal opinion from taking priority over the teachings of the Bible. (This is typically where sinful man comes in like I said before). Tom, how do you know what the link I sent you asks or states if you never listen to 1 word? I have NEVER refused to listen to or read something from someone catholic…. (no fear here). I’ll add you to the list of those whom are afraid to listen. You say “Apostolic Succession” is clearly taught in Matthew 16. Catholicism has only twisted the Greek to allow for that to appear to happen. Jesus said, “I say to you you’re Peter and on this rock I’ll build my church.” You are Peter and upon this rock I will build my church. It’s a play on words. He’s not saying you are Peter and upon you I’ll build my church. You are Peter – petros. Petros, small stone. Upon this petra, rock bed, I will build my church. What rock bed? The rock bed of the reality of Christ. Simon Peter in verse 16, “Thou art the Christ, the son of the Living God.” And Jesus says, “Blessed are you, Simon Bar-Jonah, because flesh and blood didn’t reveal this to you. My father who is in heaven I say you are a small stone but it’s on the rock bed of who I am that I will build my church.” How can that be perverted? The language is crystal clear. Obviously talking to you is a mute point. I am finished. Thank you.